A two-volume hardcover slipcased with audio DVD: this is presidential power in its rawest form, revealed alongside the private vulnerabilities of the world's most public man. 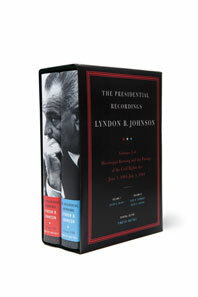 As one of Lyndon B. Johnson's first presidential acts following the tragic assassination of John F. Kennedy, he ordered a secret taping system installed in the White House and began recording his telephone conversations. 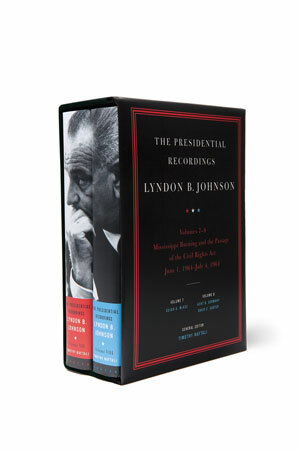 These volumes, which continue the University of Virginia's Miller Center of Public Affairs's acclaimed Presidential Recordings series, cover the time period between June 1, 1964, and July 4, 1964. During these dramatic weeks, Johnson continued to struggle with America's course in Vietnam, sought to implement his vision of a Great Society, finally signed into law the momentous civil rights bill introduced by Kennedy before his assassination, and dealt with his first national domestic crisis when, after the bill's passage, three civil rights workers went missing in Mississippi, an incident that would test Johnson's commitment to civil rights and become one of the defining moments of his presidency.